In Part 1 we looked at environmentalism as a worldview, a system, and ultimately as a religion—for so it is. In this part we will explore the foundations of the green movement. This is where the idea of human evolution becomes so important. Modern environmentalism and Darwin’s dangerous ideas are coupled like a nest of snakes that are writhing together. Evolutionary theory denies the existence of a hierarchy of beings, declaring that there is only genealogical similarities & differences rising out a 3.5 billion year saga of organic inheritance in which we are only minor players. Taken seriously he says, evolution means there is no basis for seeing humans as more advanced or developed than any other species. Homo sapiens are not the goal of evolution, for as near as we can tell evolution has no telos (goal, purpose). No meaning. It simply unfolds, he says. Life form after life form. Elephants are no more developed than toadstools. Fish are no less advanced than birds. Carriages have as much ecological status as kings. Darwin invites humanity to face the fact that the observation of nature has revealed not one scrap of evidence that mankind is superior or special or even particularly more interesting than, say, lichens. The Bible tells us that the world was made especially for man. Environmentalist dogma contradicts the Bible in every way. This is because of a kind of green-for-spiritual-flaws which I will again summarize. Environmentalism is broad enough to capture not only the overtly religious but even atheists who sense with an awe and wonder the power and invisible qualities of God revealed in His creation (Romans 1:20). Evolutionary biologist and belligerent atheist E. O. Wilson would woo Christians to see the possibilities of such a union. The consequences of the evolutionary worldview he sees are brutal. He can’t handle it and he offers in exchange some sweet incense of vedantic hope. Flesh will grow old—yes he acknowledges this—it will decay and fade away, but the earth in her timeless rhythms, he says, continuously evolve in the fertile womb of a venus of some sorts, and will allow us to live on in the atoms forever. God’s word suggests exactly the opposite. It is the Word of the Lord that endures forever (1 Peter 1:23). But the earth will wither like the grass and fade away (vv 24-25). According to the environmentalist fantasy, when the nether realms of the earth absorb our flesh we will engage again and again in the creative cosmic cycle of reduce-reuse-recycle and turn into the new & improved evolutionary model. Reincarnation, Sir. Mckibben urges his readers to be aware of and attuned to these wonderful ancient rhythms of nature. Rhythms, he believes, with power to help one find fulfillment—a sense of meaning and a place in the world. And he is pushing this very heavily amongst many, many churches. That’s from atheist space physicist Carl Sagan in his award winning government-funded documentary “Cosmos.” Some of you may remember this from the early eighties. He’s trying to make church bells peal in the minds and hearts of the people he is speaking to, though he was a hard-core materialist atheist. This speaks of human beings as unimportant specks—Atomic specks on a pale blue dot adrift in a cold cosmic sea of space and time. That doesn’t compete very well with Mckibben’s much warmer emphasis on “mother” earth the nurturer. Nonetheless, the atheist and the environmentalists and the theistic environmentalist both cling to the skirts of some kind mother figure that birthed them in their mythology – via evolution. Each April 22, the United Nations celebrates what its general assembly terms International Mother Earth day (my wife and I were in DC for this event in 2012). I know it’s hard to believe – it not called Earth Day anymore—it’s now called Mother Earth Day. It’s now clear that “We don’t own the planet. We belong to it” (from the Bolivian president (at the 2011 UN Earth day 2011)). Similarly, the United Nations secretary general urged “government businesses and citizens of the world to give our mother earth the respect and care she deserves.” Not content with mere symbolism, the United Nations debated a draft in international treaty giving mother earth the same rights as humans (2011). Let that sink in for a moment. Some Spanish provinces, Germany and New Zealand as well, already grant legal rights to—wait for it—apes. Switzerland gives plants human rights. Bolivia gives humans rights to plants, bugs, and eco systems. In 2011, President Obama’s regulatory czar Cass Sunstein predicted that we will SOON have laws that allow animals and plants to sue humans for violating their sacred rights. Watch out what you eat, because the government may eventually have lawyer ready to take the case (although some of that has been rolled back under the current administration, it will likely rise up again in the next 8-10 years).. These ideas are very closely connected—in the sense that “We’re all humans now.” Actually we’re not, the Bible makes a clear distinction between humans and animals (Matthew 10:31). In our day, the United Nations Earth Charter codifies the sacredness of the earth. The Earth Charter of the UN which is being implemented in various ways in cities around this country through the United Nations agenda 21, forms the green replacement of the Ten Commandments of the Bible. In fact, they have a bunch of commandments that they carry around in an ark. Steven Rockefeller—the head of the earth charter commission—coordinated the drafting of the deeply religious document. It uses connotation language which gullible Christians might find laudable. It argues that protection of the earth is a sacred trust. It argues that human beings must identify themselves with “the whole earth community.” You need to think about these things carefully – what is wrong with identifying yourself with the whole earth community? We to understand exactly what they are saying. My children are not trees. Yours aren’t. He says that we should learn to live with “reverence for the mystery of being, gratitude for the gift of life, and humility regarding the human place in nature. Stop thinking that humans are so important.” Not only do many atheists, pantheist and professing Christians support these ideas but so does the 1000 US member conference of mayors and other politically influential entities. Buddhists and Baha’i do too. Jews through Jains all support this. But in a world of sinners I ask you, is this what the Scripture teaches, where everything is sacred or holy, therefore worthy of reverence? In that kind of world, nothing is sacred. The view that ordinary existence is holy in itself has become popular in all major religions and it is a plural, I believe, of the world’s spirit. And it flows from the evolutionary belief in the connectedness of all things. In fact, evolution requires death as a positive force for hope and change. Environmentalism adds to this the corollary—that the death of humans is especially desirable. Scripture states that death is an upheaval against the natural order that God originally intended. Death is unnatural and ugly (Great Controversy, Why Were Sin And Suffering Permitted?). Jesus knew it better than we do, better than we could, because He was there in the beginning when Adam sinned and brought that curse upon the planet. And more than this, He came himself to die—to pay the wages of sin, “for the wages of sin is death.” And so we can understand then why Jesus wept when He beheld the grave—of sin and this world—holding the corpse of Lazarus whom he loved. Adam’s disobedience and rebellion, not evolutionary fairy tales—is what brought calamity to the world. It is the Great Controversy. Thus the primary direction of influence is not the earth on man, but man upon the earth. And this is so because our relationship to the earth is mainly religious. God first cursed Satan for his role in the fall, and then Adam and Eve and all of their posterity. The curse extended to the entire cosmos, affecting all of its living creatures. God did not curse the watching righteous angels, as they are chiefly observers in this cosmic theater. And though Satan himself also sinned, there was no general curse on the Earth for Satan’s sake. The earth was not cursed for Satan’s sin, but rather for man’s. Satan bears his own guilt, but he passes none on to any other creature (as illustrated in the Scapegoat—Leviticus 16). So why then did God curse the Earth? It (the Earth) did not cause Adam to sin—it could not be blamed. Neither did the other birds or beast, yet He cursed all, not only the serpent. It was because of man that the cosmos was cursed. And this displays ever so clearly man’s relationship to the Earth and to the rest of the cosmos and created order. Moral responsibility accrues to man alone. The cosmos—Earth in particular—on which man lives in the drama of creation, fall and redemption is the stage which God uses to reveal this plan. We call it the Great Controversy. And even though it was but the stage in which man acted out this original disobedience, it too must become marred and broken. Now if the cosmos had some kind of voluntary consciousness as many environmentalists claim—if the beasts did have some—then their guilt would be real. For if they had some moral consciousness, why did they not rise up and smite that demon-possessed serpent, or sound the alarm? They were passive because this is their nature — they are not moral agents. So nobody blames the Earth. It has no moral agency and no guilty conscience. Yet it suffers a punishment. We don’t blame cows or goats do we? And yet they must die too. Why? Because of man. Man’s exalted position compels the Earth to share in the consequences of our first parent’s actions. But neither to the Earth nor to the beast that died because of the sin of Adam, is there any attribution of guilt. None. This is no consolation—there still is death, but at least there is no guilt. This is something that is unique to human beings. This is laid upon Adam and his wife. Each of us knows the burden of a guilty conscience. Why? Because we are altogether different from the beasts. And we are altogether different from the Earth. Scripture proclaims Adam & eve sinners because they were, unlike the creatures, moral agents. Their sin was the transgression and lack of conformity to God’s Law. Eve didn’t just break the Law by eating the forbidden fruit, she positively encouraged her husband to do likewise, and he—loving her more than God—willfully and willingly disobeyed his Creator. Remembrance of this tragedy is surely one reason Jesus warned his contemporaries just several thousand years after Adam. “If anyone comes to me and does not hate his father and mother wife and children brothers and sisters, yes and his own life also, he cannot be my disciple (Luke 14:26). Nothing should be above Him. A radical all-consuming passion for God is His design for the lives of each person created in God’s image. Anything less is not worthy of God. Adam was not worthy and God cursed him and his posterity to a life of misery and suffering here on Earth, followed by death. “Through one man’s offense, judgment came unto all men resulting in condemnation, and by one man’s offense many died” (Romans 5:18). If this is true then, every living thing is also the image of God. But it’s not true! The Bible tells us otherwise. God no longer took pleasure in Adam. And this alone—if you can get into the mind of Adam—should render him inconsolable. Separation from God. The grief of having sinned against his Father. We don’t know if God brought a creature and slaughtered it before a horrified and sickened Adam & Eve. We don’t know that, but we do know that God killed a creature, at least one. It was a creature that he had made, and Adam and his wife had to bear on their bodies the rotting skins, torn from the bloody flesh of these creatures. The opening death recorded in the history of the cosmos is that of an innocent beast. And by this sign we learn that their nakedness—a strong awareness of their newly earned depravity—was to be covered at the expense of life. The heavens the earth and all the creatures great and small received the brand as it were, with the mark of Adam’s condemnation. God wanted Adam and all of us to ponder this point very carefully. It explained how the entire cosmos was defiled as a result of sin. God didn’t explain to the beasts, but he explained to man alone. And this is plain from God’s first approach to Adam—while he was hiding—God called to him. And then the Lord interrogated Adam as the federal head of the human race. Then Adam blamed his wife, and while he was doing this, God questioned her. But He didn’t question the serpent. There was no need to, because to the devil he would hold out no hope of pardon. In the animal skins, Adam received visible tokens to contemplate the wrath of God in the spoken curse. He also experienced a change in his fundamental nature through the loss of original righteousness and holiness (innocence) in the visible marring of the cosmos, and in the death of the animal whose skin he wore. You can only imagine what despair filled his heart. But in the midst of this, God brought to him a precious promise to ponder. Though Satan be a fearful enemy, yet the seed of the woman would eventually crush his head. And all of this made Adam look ahead with hope to the day of fulfillment of Gods promise. And this is the great difference between man and beast. Animals do not reflect on the distant future or have present enjoyments diminished by the intellectual prospect of their impending death. They don’t worry that they are not living up to the ways of their ancestors. Goats do not fret over global warming, or worry that their kids have a purpose-driven life. Unlike the beast, who only feel the effect of Adam’s depravity, human beings are also able to meditate on these things and engage the world in bringing its ideas into contemplation of God, and arranging them and comparing them with reflection and abstraction. Animals don’t do any of this. Ancient pagans—if you go to Greece you see there, that they believed that there were spirits on every side. There were spirits in the wood and trees. They ascribed spiritual qualities to all of nature. But most still remembered somehow that they were themselves the children of God in some way. The fact is we are not angels, neither are we animals. Nor are we devils. 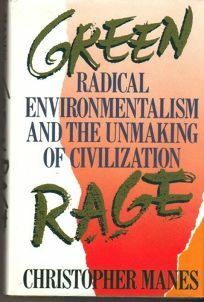 Environmentalism’s slogans feature planetary salvation, buts its way of salvation is dangerously out of touch with the most basic of human emotions. It is harmful to the environment and humans, particularly the poor. Many people will claim that we need to be environmentalists to help the poor and yet in fact, environmentalism is particularly harmful to the poor (more about that later). Because of sin, we need to ask ourselves how it is that we make decisions. How is it that we live and what moves us? Unfortunately, because of sin, we humans often have an ethic which is less animal like and more devilish, in fact. Actually it’s a tenderness that one doesn’t associate with Toni Vernelli. I would that she had in her heart animal tenderness for her young (several abortions). In her, we see how an idea—a hopeless lie, once it has been ignited can easily lead to suicide and death. Unreasoning animals unlike humans are totally immersed in the moment. It’s all about the moment, for animals. The great grey wolf shot dead high on a ridge is a case in point. Before the green fire in his eyes died out he had been attuned to the scent carried by the breeze. The wildness of the world and his part in it, he didn’t care to meditate on the meaning of it all. But he was alive to the immediacy of each moment, every nerve tingling to the nervous energy coursing around and through him. At least that’s what environmentalists of all stripes urge for humanity—getting in touch with your inner beast. They believe—at some irrational animal level—that all creatures share a collective consciousness with all matter and energy. They think that we need to get in touch with that inner beast. It’s a sense of feeling way beyond reason. But it seems to me that environmentalists place upon animals a burden that they are incapable of carrying. They are not reduced humans—they are beasts. We are not evolved animals—we are the image of God. The narcissistic impulses of modern civilization (which is enamored with Hollywood style religion & light) find momentarily satisfying this green religion of self. That’s what it really is about. This is what it boils down to—unreasoning animalistic mystical communion with an unrevealed and unknowable God. Call it Buddha. Call it baby Jesus. Call it Gaia, or just plain old Mother Nature. This demands the star & naval-gazing that brings a communicate to good old number one. In the end, the new religion of environmentalism that greens embrace boils down to the temptation in the Garden of Eden. To be number one. To do it my way! To see God as an idealized image of myself. In summary, the material creation is neither divine nor eternal. 1) It is not sacred. 2) Not of intrinsic value – nor in unity with mankind in any spiritual sense. Science gives no support for such ideas. Christ and the Bible teach that fallen man is a creature of God whose ancestry is not animal but divine through adoption. And that God made the earth for man, not vice-versa. 3) Creation will not collapse due to civilization, in spite of current Climate Change paranoia. It will be destroyed by God Himself at His Second Coming, to make way for its recreation as the Earth made new (Isaiah 65:17; Revelation 21:1). 4) The Earth was not created for our kinship. God has called us to a relationship with Himself, and other people. Let us share the Everlasting Gospel with as many people as possible. Environmentalism is by its very nature a religion of death. Those who have vigorously argued that man is a naked ape (an animal borne on by cosmic tides) they are toying with a deadly creature; they are playing with serpents. Or is the serpent playing with them?